EU Commission President Jean-Claude Juncker undermined a key part of Britain's plan to quit the bloc, warning that it cannot expect to remain in parts of the single market. Delivering his annual state-of-the-union speech to the European Parliament, Mr Juncker said the EU will not allow Britain to participate only in some parts of the single market after Brexit without honouring all of the rules. He said that the UK cannot expect to remain in parts of the single market after Brexit. Mr Juncker said he respected Britain's decision to leave the union, but warned, however: "If you leave the union you are of course not part of our single market and certainly not only in parts of it." He also said the EU must develop a muscular foreign policy to match its economic strength. "We must become a greater global actor," the head of the EU executive told MEPs in French, before switching to English: "Yes we are global payers, but we have to be global players too." He said the EU should flex its potential strength as a world power as the United States under President Donald Trump pulls back from international engagement. He said that when united, the EU was a force to be reckoned with. "Whenever Europe speaks as one, we can impose our position on others," Mr Juncker said. 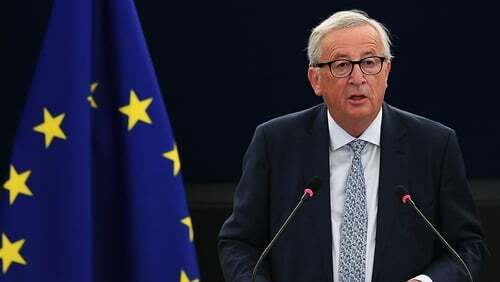 As he begins a final year in office that will see European select a new EU legislature in May, Mr Juncker noted his successful bid to talk Mr Trump out of an immediate tariff war in July and highlighted new interest from China in working with Brussels to keep world trade flowing free. Pointing to questions in many countries over Washington's role as the global economic leader, Mr Juncker also said the euro should be better promoted as a world currency, querying why EU energy imports, for example, are mostly priced in dollars when almost none of them come from the United States. The commission wants to complete an EU trade pact with Japan by May, one of several deals that is consolidating the EU at the heart of a web of global agreements on standards as Mr Trump has turned Washington against multilateral obligations. Mr Juncker also called for establishing an EU border and coastguard force of 10,000 people in two years, as the EU bolsters efforts to reduce migration. "The European Commission is today proposing to strengthen the European Border and Coast Guard to better protect our external borders with an additional 10,000 European border guards by 2020."